Are You Caught up in a Battle of Wills With Your Puppy On Walks? You know that awkward moment when your ten week old puppy plops himself down in the middle of the sidewalk and won’t move anywhere? Things were going so well (or so you thought), and now you’re bracing yourself for the battle of wills that seems to be turning into a routine. Not only are you frustrated with your pup, but you’re caught between a rock and hard place. Do you drag him for the next five blocks? Do you resort to getting out that treat yet again? No thanks to the suggestions of nosy passersby (“You shouldn’t walk your puppy so long!”, “He looks tired, I think he needs water”), you finally decide that you just can’t deal with it today. You pick him up and take him home. Does this scenario sound familiar? 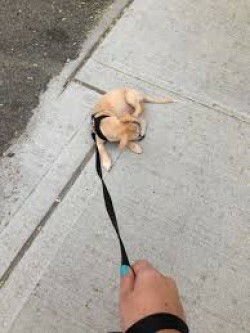 I often get asked by my clients what they should do when their puppy doesn’t want to walk. A whole lot of people seem to encounter this particular problem. So many in fact, that it got me wondering if this might occur more often in the city than it does in quieter, more suburban environments. For some reason we’ve been pummelled over and over with the idea that our puppies should obey us. After all, a good dog is an obedient dog right? Not only does this approach to training set us up for failure, but it creates a power dynamic with our dogs that becomes more about performance than relationship. Here’s the thing about walking a puppy in the city. It’s scary. There are trucks, bikes, honking horns, people in hats, people in beards, and bearded people with hats riding bikes. When you stop to think about it, it makes perfect sense that your puppy (most likely just arrived from a breeder in the country) wouldn’t want to walk for an hour straight in the busy streets of your neighbourhood. Instead of becoming hell-bent on having a dog walk in a perfect heel for the whole time, think of the walk as his time to experience the world. This means that if your puppy wants to sit on your front lawn for half an hour and watch the world go by then that’s exactly what you should let him do. Free yourself from the idea that a “good dog” should do exactly as you say. If you allow him to put on the gas and put on the brakes then guess what? He’ll be much more likely to trust you next time. With each day he’ll grow a little in confidence, and before long, you’ll be longing for the days when you didn’t have to go farther than your city block! Once he’s confident and secure in his environment, then by all means, get out your clicker and start working on those leash skills! If you have an adult dog that is still flopping on the sidewalk you might need to call a trainer but, for now, you can just enjoy the world through your puppy’s eyes and watch him figure it out as he grows.